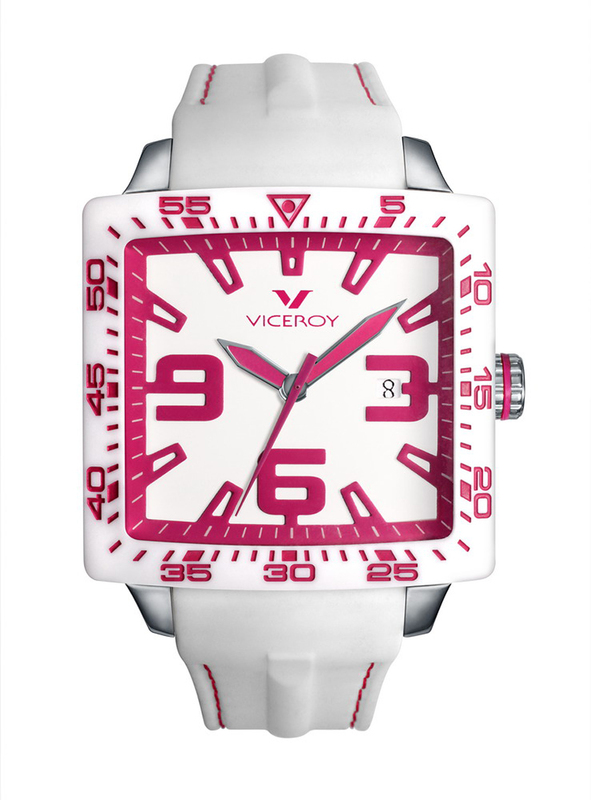 The Fun Colors collection by Viceroy is a spirited series of watches for anyone with a real lust for life. The Fun Colors Square models within the collection offer a change of pace from the everyday circular shapes that are so common in watch designs. 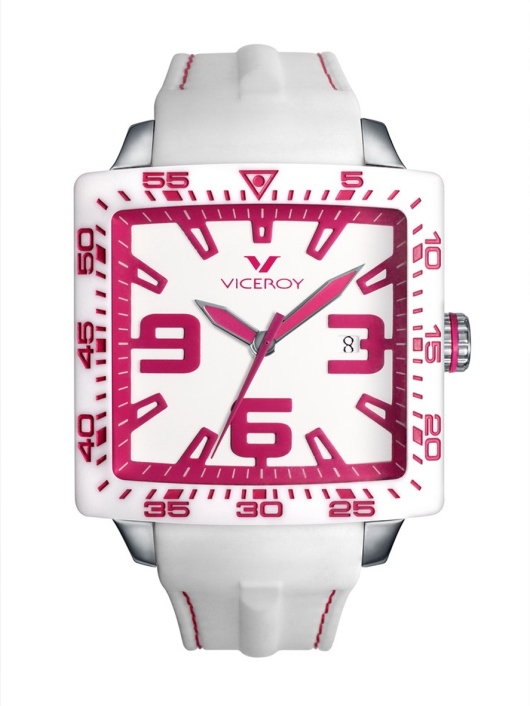 Like other watches in the series, Fun Colors Square watches come in a variety of big cases, 42 x 42 mm, in either bright white or rich black, both of which provide a perfect foundation for other colors to be overlaid. One great feature of square cases in general is that they are less common and offer fashion-minded people a way of creating different looks involving more geometric patterns, especially when paired with accessories such as belt buckles and jewelry. Along with color, texture is an important feature of the Fun Colors Square collection. The slate-colored black dial of the model pictured has a sunray pattern that permeates the dial with energy and movement, and changes slightly depending on the light. 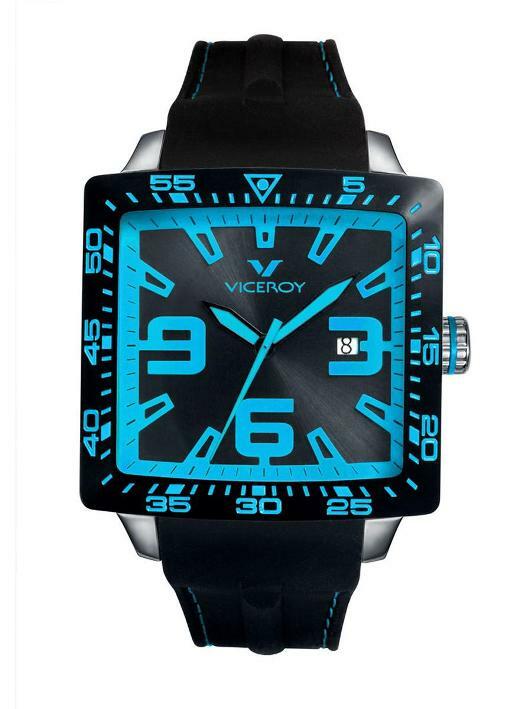 This model has light-blue features: everything from the dial, to the strap stitching and the crown accent share this color. Other watches in the collection have similar color arrangements, but the variety of the colors available means there is one for every person’s taste. The large sword-shaped hour and minute hands are common to the collection, too; the hands are easy to read and remind us of traditional pilots watches. Watch lovers will note an interesting and rarely seen design feature of the Fun Colors Square models – the seconds track, marked by indices on the dial, is repeated on the stationary dive-style bezel along with numbers, thus incorporating the bezel into time-reading and allowing the dial itself to remain uncluttered. Fun Colors Square models include those with a date function and some models are available with a chronograph. The watches are water resistant to 165 feet. Mineral glass is the front-crystal material of choice and all of the cases are made of stainless steel, each combined with a rubber strap for a fresh and sporty appeal. The watches are designed to fit both men and women comfortably so go ahead – take a break from the ordinary and go square! Purchase your new Viceroy watch from an authorized Viceroy dealer.